Long before I became a brain surgeon, I fell in love with horses—one of the ultimate “prey” species. Nowadays, I spend a large part of my time not so much training horses but teaching people through horses. I think we have powerful lessons in spiritual leadership to learn from prey species like horses. Before I can explain that, however, it is important to understand how human beings became such highly specialized and successful predators. Here’s the short version. Two and a half million years ago, our primate ancestors were forced to abandon their arboreal existence and take to the savannas because of global warming (the old-fashioned kind, produced by a change in the tilt of the planet). When our ancestors stepped out of the trees, they had to compete in the new environment, so they learned to coordinate their groups to make packs. The mark of a predator that hunts in packs—whether a wolf, a killer whale, or a human—is language, and we became the world’s most articulate beings. Along the way, we also became the world’s best makers of weapons. Language ability and dexterity for making weapons became the hallmarks of our species; literally, our “killer apps.” And as language became so important, the left side of the brain, where speech is housed, became the overwhelmingly dominant influence over our thinking. In fact, as you read these words and weigh these ideas, there’s a little voice generated in the left side of your brain reading them inside your head. Experiencing our thought processes translated into words likely created our sense of internal identity, what neurologist Antonio Damasio has called the “autobiographical self.” That self-identity, in turn, created the predator dichotomy; namely, the hunter and the prey. The subject and the object; the inside—the me—versus everything else that is outside. Language in many ways gave birth both to me and to my sense of separation. Prey animals, especially herd animals like the horse, for example, do not experience an autobiographical self in the same ways that we do. Horses also do not rely on vocalization to communicate, because using sound would give away their position to predators. Instead, they rely on a very eloquent but silent method of communication developed millions of years before humans arrived on the scene. Using their body language, stance, and position, they convey a huge lexicon, named Equus by horseman Monty Roberts. This language is built upon sensing energy, or chi, and conveying meaningful, energetic messages. A mere twitch of the ears, a change in the slope of the shoulders, or a shift in the hips is enough to send ripples of energy throughout all members of the herd. To best conceptualize this, look at film footage of zebras nervously sipping at the edge of a watering hole. Some zebras dip while others rise. Ears perk up, swinging back and forth. Eyes widen. Heads swivel. Nostrils test the wind. And then they sense the predator. They feel the lioness crouching low in the grass. They experience the intensity of her hungry stare, the tension encircling her whole body. Even the nervous twitch of her tail is palpable to the zebras. A live zebra feels all that. The dead zebra is the one that waited to be sure. With such profound connection, there is also an enormous difference in identity. Since their survival is tied to being a herd member, a prey animal has a strong communion with its group. As predators, it is hard for us to grasp what it means to belong to, to be a herd. A horse is only half a horse without its herd. Its identity is a “we.” In normal states of consciousness, we can only envy animals their sense of immersion, being of and in the world. But that doesn’t mean we don’t have any access to the experience of prey animals. The experience is inside our brains as well. In fact, we can look at the division of functions between the left and right sides of the brain almost like a parceling out of predatory, self-absorbed functions in the dominant left hemisphere and the prey-like, herd-connected functions in the silent right half. The left brain, for example, will look at a photograph and determine when and where the picture was snapped. It sifts for clues like a detective. “When was my hair that long? Is that the Student Union building in the background?” The right brain, on the other hand, looks at the same photo and silently expresses the emotional content: “My, look at how happy we all are in that snapshot! I was so in love back then.” The left thinks; the right feels. The left makes diagrams, while the right paints pictures. The left develops painstakingly detailed instruction manuals, while the right translates the power of poetic imagery. And ultimately, the left separates the universe into what is “me” and what is not me, while the right feels a communion with all the life-forms and energy around it, the way a horse might feel the world. In many ways, spiritual leadership follows a similar trajectory, moving from an individualistic, predatory point of view to one that is wedded to a much more universal, prey-animals sense of being immersed in a greater awareness. Of going from personal right to universal rights. Of shifting one’s own perspective to a global one. Of seeing life as more than mere existence but rather as purposeful being. Lawrence Kohlberg was one of the iconic thinkers in the field of moral development, and he delineated a developmental timetable along which morality emerges. Kohlberg has shown that children under the age of 10 seem to grasp right and wrong as a matter of rules handed down to them by adults. After 10, children begin to conceive of moral decisions in terms of their consequences. In other words, perception of wrong lies not so much in one’s own mind as it does in how others may see it. At this stage, wrongdoing is simply what gets punished. Adolescence is when morality becomes a matter of relationships: you don’t wrong those you like or love. The fourth stage is where morality is a reflection of societal order, where the notions of justice, of crime versus duty, begin to emerge. Society is the arbiter of good and bad. The last two stages represent the sense of a social contract and the notion of universal principles. In the former, there’s a central algorithm that society exists to uphold the liberties of the individual without infringing on the rights of others. In the latter, a rare individual reaches the realm of universal principles of morality. For example, civil disobedience, as both Gandhi and Martin Luther King Jr. advocated, may be required to ensure a more just society. Breaking the law is morally correct when doing so helps to ensure a greater good, when it serves a higher sense of justice. So our sense of connection, of empathy for our fellow man and woman, becomes our compass guiding us toward spiritual leadership. When we watch the next nature show on television, we can see beyond the life-and-death struggle of a lion stalking a zebra on the savanna. It’s not just a physical struggle for survival between predator and prey; it’s a metaphorical contest between an “eat what you kill” view of capitalism versus a corporate notion of global responsibility—a “we share the food we eat” attitude. It is moving from an individual perspective to a worldview. The contest between right and left hemispheres is between differentiating and integrating. Between getting and giving. If, in the broadest sense of the word, spirituality is about connecting and, as Pastor Rick Warren states, “leadership is about stewardship,” then the path of spiritual leadership may carry us along the path of the lamb, of creating collective stewardship. Every horse, every member of a herd, asks one question of the leader: Are you in charge, or am I? Each horse is looking for someone to lead the herd—even just a herd of two. The horse needs an answer. If you exhibit the four C’s (command, control, compassion, communication), the horse will accept you as otancan—the leader. If not, the horse must assume leadership over you. Otancan is the Lakota word for “leader, the greatest.” Once the horse recognizes you as otancan, it has two obligations to fulfill. The first is to follow you. In return, the horse expects you to look after it by exhibiting the four C’s. The horse’s second obligation—one that many humans find difficult to accept—is to repeatedly challenge you as otancan. As the trainer, you are not permitted to remain otancan unless you consistently prove that you deserve to be. That’s the otancan’s burden. If you accept becoming the otancan, being worthy in the eyes of your horse, you must rise to the challenge by bringing impeccability to your relationship. You develop a partnership with the horse that frees you of your personal agenda, your private needs. Instead, you listen and look after the needs of your horse. Finally, to be truly in charge, you can’t really need to be. Leadership is something your horse bestows upon you, never something you get because you demand it. Being a leader is a reward, not a right, and it should come because the horse recognizes the leader in you. You must shift perspective from the left-hemisphere position, where you believe you deserve something, to the more right-brain perspective, of seeking to earn the recognition. With respect to the results of natural horsemanship, I am inspired by the quote from the Taoist philosopher Lao-tzu: “When the effective leader is finished with his work, the people say it happened naturally.” So it should be with your leadership of your horse. 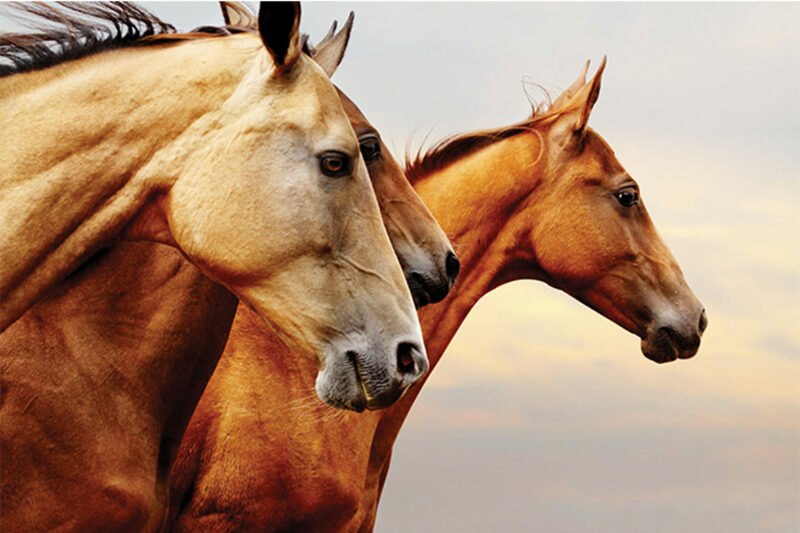 Horses immerse us in an energetic context, beyond reason but within the reach of emotion. They provide us with detailed feedback about how adept (or clumsy) we are at feeling energy and moving it. We learn from our equine partners how to clear our minds. We silence the incessant reminders that our brain is producing about our personal needs, appetites, and anxieties. When we do, our energetic output suddenly surges. Our ability to sense and manipulate chi sharpens. As we acquire the ability to concentrate and focus chi at will, our goals begin to clarify themselves effortlessly. Dr. Allan J. Hamilton is a horse trainer and a Harvard-trained brain surgeon. His latest book is Zen Mind, Zen Horse: The Science and Spirituality of Working with Horses (Storey Publishing).